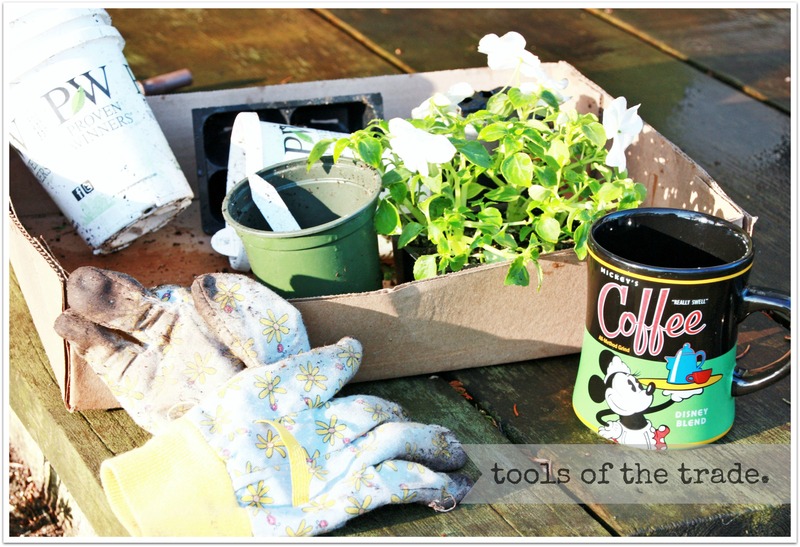 One of my very first blog posts was about my window box and how I fill it up for winter. Yikes, that seems so long ago! But I’ve survived the long winter, and it’s time to fill the window box for summer. It runs the full length of my front porch, which faces the street. So I give it full priority each season because it is the mainstay of my curb appeal. For the past several years I’ve been filling it with coleus in a mix bright lime greens and dark wine colors. As you can see, they fill in nicely and do really well out there. My house faces north, so I have somewhat limited options. Big bloomers that love full sun aren’t at home there. 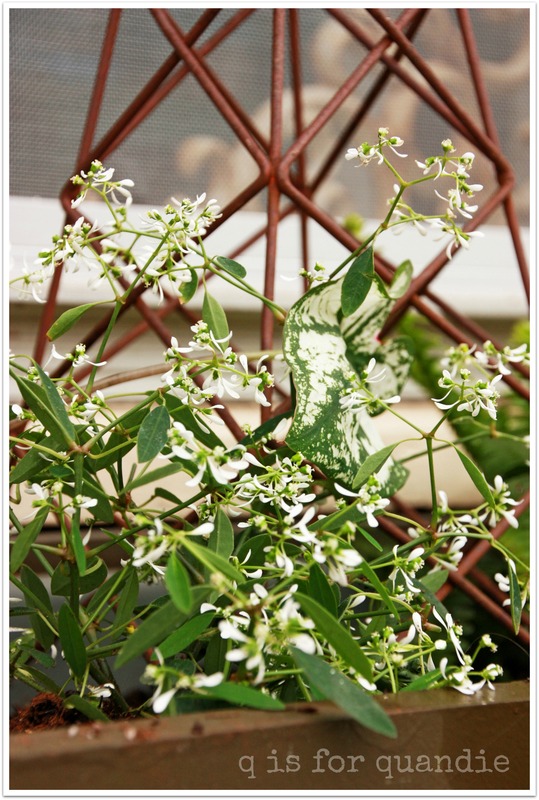 I tend to pick plants more for their foliage rather than their blooms anyway. That’s just the way I roll. I wanted to change it up this year though, so I searched for some pinspiration and found this. More subdued. All shade loving plants. I went a little more monochromatic and left the hot pink impatiens out of my mix. I added some white and green Caladium and some Euphorbia. Euphorbia likes at least part sun, so I’m taking a chance that it will do well here, but I love its ethereal quality. I also used a fern that I discovered last year at Bachmans called Nephrolepis Jester’s Crown. 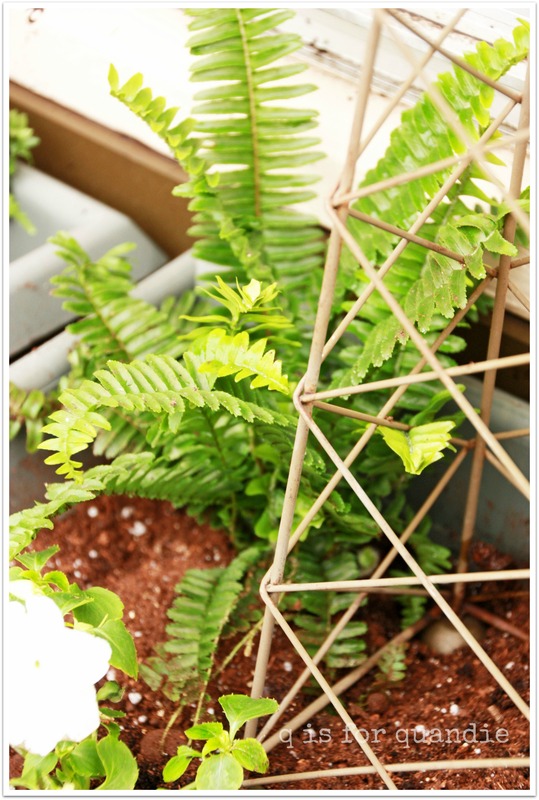 It’s a little more compact and upright than the fern in my inspiration photo. I have a little tip for you if you garden in the burbs like I do, head outside at 7 a.m. No one else is out and about so the neighborhood is quiet, the birds are singing, there is amazing light for photos and it’s just all around sublime. Here are my tools of the trade. Coffee in my favorite Disney mug, plants, gloves. In that order. 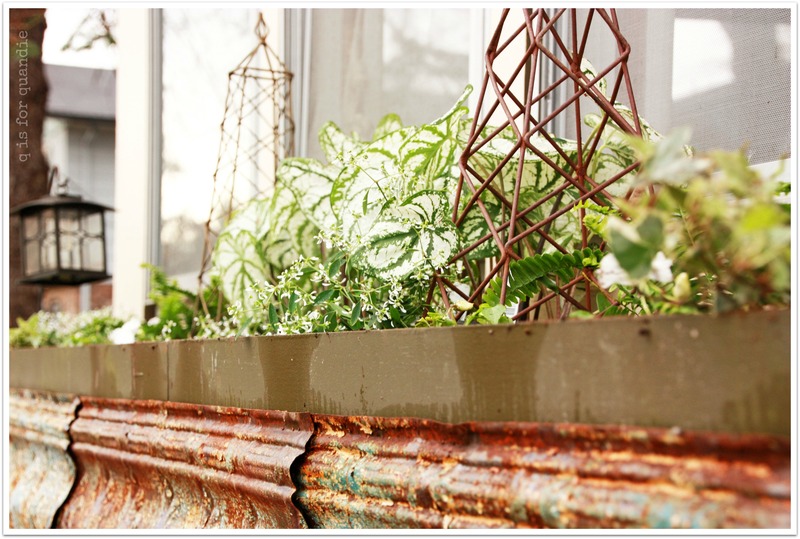 Have I mentioned that my window box is clad in some old metal crown molding that I purchased at Oronoco Gold Rush? It started out painted white (as you can see in the first photo above), but it has chipped to reveal a layer of blue and then rusted in a most magnificent fashion. So, here it is all planted. I confess, I have artfully arranged these photos so that you can’t see how really sparse it looks right now. Also, I faked it with the Caladium. They are still in their pots because they tend to be very sensitive to the cold, and just in case we get one more cold snap here in Minnesota, I need to be able to pull them out and put them in the house overnight. In another month or so it will fill in and the plants will spill over a bit. By the end of summer it will be bursting with white impatiens. I’ll try to remember to share some more photos with you then. Your rusted crown molding is awesome! Like what you have done with your plants too. Look forward to seeing the mature version. My house also faces north so I have the same limitations. 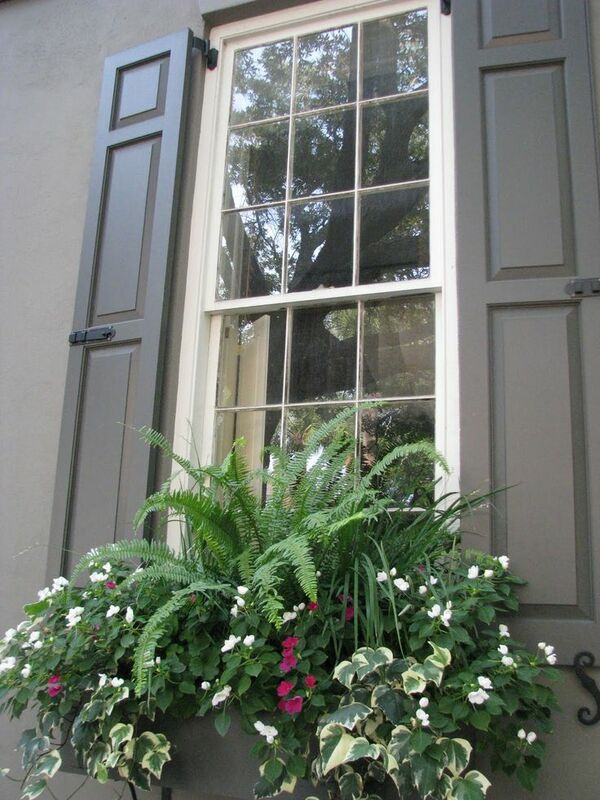 I went with two large ferns in black urns this year. I have three hydrangea bushes along the steps leading up from the street so there will be plenty of color soon. Sounds classy! Ferns in urns. Fun to say out loud too 😉 Hydrangeas are one of my absolute favs. Later in the season you are bound to see mine here on the blog. I don’t know where you are, are you further south than me? Here in Minnesota we have finally been getting some better choices for hydrangeas. Two seasons ago I planted a bunch of Limelight and I love them. Yes, I am in St. Louis. I would definitely plant more hydrangeas if I had the room. They really do much better here if they are not in the hot sun and, of course, if they get watered every day. But they last well into fall and that’s what I love about them. The peonies are lovely but they come and go so quickly and one heavy rain and they are on the ground. I absolutely adore peonies. It is a bummer that they have such a short blooming period. I put cages around mine, which helps with the rain problem … and tends to look crappy for the rest of the time! I’ve also been having a lot of trouble with powdery mildew the last several years, which looks terrible too! But darn those flowers are gorgeous while they last. Whew, all those plant names are mind-boggling. I can’t even begin to try to pronounce most of them. And spelling them? No way. Which is probably the way it should be, since I mainly enjoy looking at other people’s creative arrangements and not actually doing any planting myself. LOL Keep up the good work Linda – looking forward to seeing more pictures as they mature. My building faces north, also, so this is an inspiring post for me. I’m off to find that purple coleus with the lime green (potato vine?) trailing stems. I’m eager to see how this year’s selection turns out. 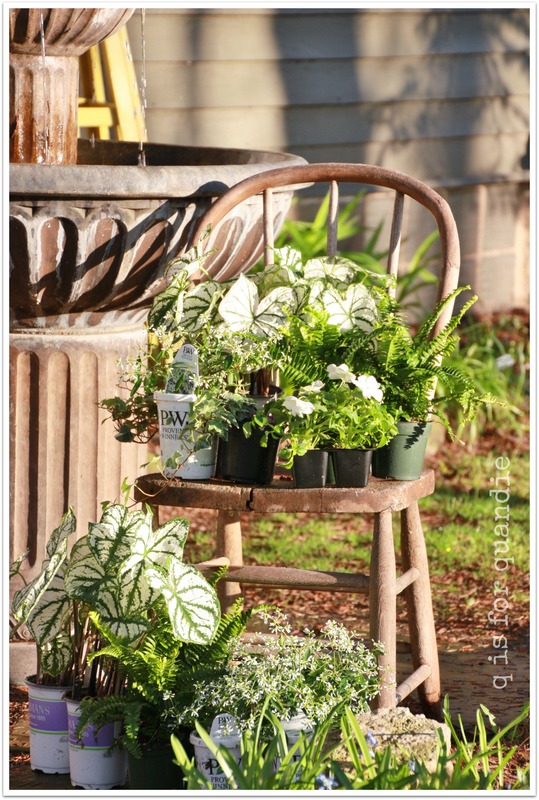 I’ve already got six pots of white impatiens, and lobelia and am putting all of it in a big cart out front this year. I think white shows up the best here. That chippy tin is so gorgeous. There are some absolutely gorgeous coleus out there these days. And yes, those are potato vines … and I think also some creeping Jenny. I also love the tin on your window box. My daughter has a shelf from a “Country Living Fair” made out of old pressed tin. Really adds instant character to her place. 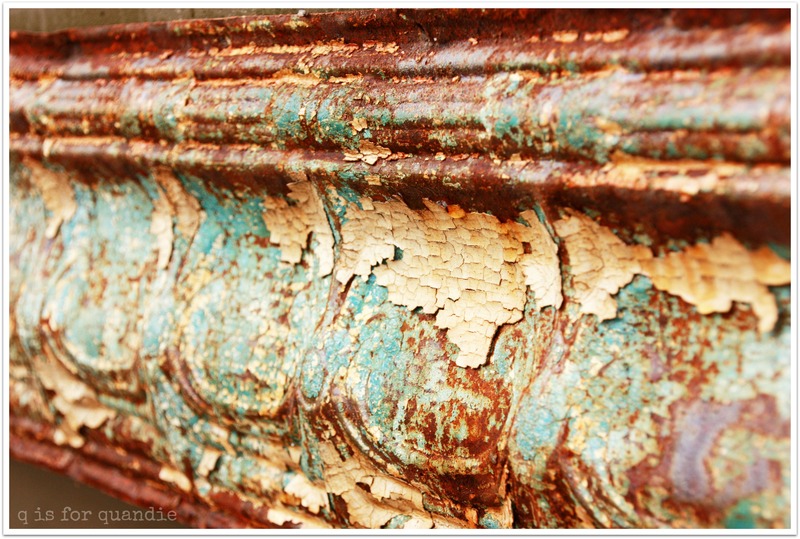 Your place has inherent character due to it age and it’s owner ‘s eye. My house faces south, so no shade plants for me. I am such a fan of euphoria it’s hard to find here though. On my list today is to purchase new plants to replace the pansies dying from the heat. Thank goodness the high is 82 today and not 90. 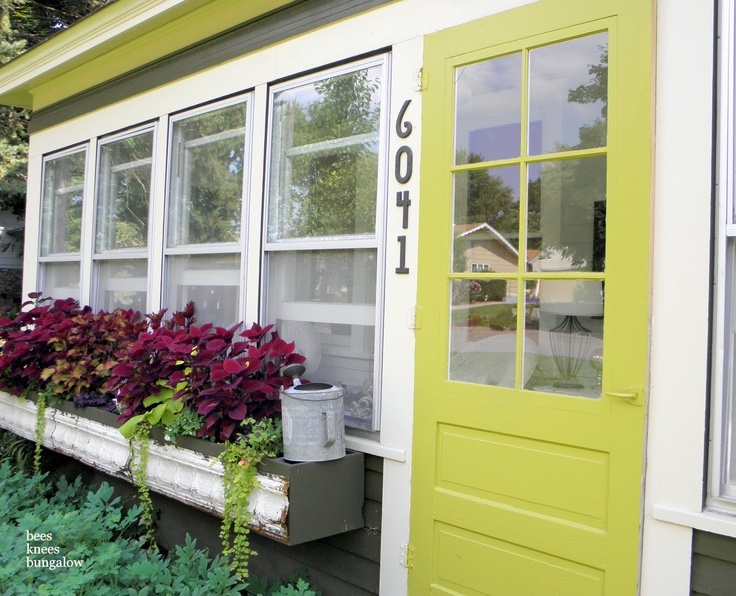 I really like the coleus with your front door color but like you I love variety too. Love the fern this promises to be a winner. Variety is the spice of life 😉 You get a high of 82, and I am going to have to bring in the caladium and cover my window box tonight because we have a frost advisory! Go figure. Thanks Karen! I’m looking forward to seeing these filled in. And I think the white and green combo will really pop out of the shade I have out front.